Each year, over five million teeth are damaged or lost due to a sports or trauma injury that could have been prevented by a properly fitting mouthguard. In fact, a recent survey showed that 25% of adults use a mouthguard that is improperly fitted. While you can buy one-size-fits all mouthguards in sports stores and chemists, these aren’t nearly as effective as those that have been moulded specifically to your teeth and gums. For adults, a tailor made mouthguard is usually a one off expense that could save you oodles of cash in the long run. For children and adults engaged in physical activity that puts their teeth at risk, they are simply a must. Studies are overwhelmingly in favour of thermoformed mouthguards, which is the type you’ll find at dHealth Dentistry. These offer more thickness and the precise fit not only offers better protection it also offers less interference with breathing than a stock mouthguard does. You can also incorporate team colours into the mouthguard, which is fantastic for team sports. There are three types of thermoformed mouthguards, single, double and triple laminate. Single laminate mouthguards are for low-impact sports like basketball and soccer, double laminate mouthguards are for medium impact sports such as rugby or AFL and triple laminate is for high impact sports such as martial arts or professional levels of AFL or Rugby. 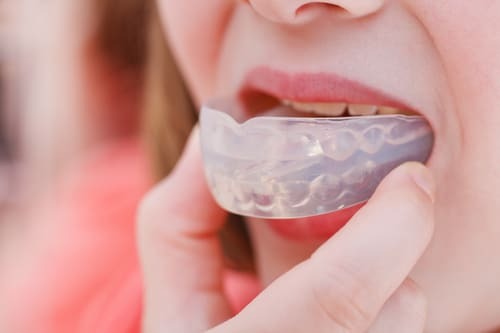 At dhealth Dentistry, we offer a complete range of mouth guard options from professional mouth guards through to mouth guards for martial arts and MMA professionals. See the Australian Dental Associations Fact Sheet for more information. Creating a mouthguard that fits perfectly will ensure that your teeth stay safe, even under the heaviest contact. Making the perfect mouthguard is a simple process. We only need two dentist appointments – the first to take a mould of your teeth and jaw shape, and the second to fit the mouthguard. It really is as simple and painless as that. Children will require new mouthguards as they grow. On average, most children require one new one each year (an adult can usually wear the same mouthgaurd for at least two years). In the case of a child that is experiencing a growth spurt, the experienced team at dhealth Dentistry may recommend a re-mouldable mouthguard, or we simply block out the areas where teeth are erupting. And, even if you or your children have braces, we can still create a custom mouthgaurd for them. All we do is use some wax to block out the brackets and wires, and then follow the same process as usual. In fact, it’s actually even more important that people with braces wear mouthguards—the dental trauma that you’re likely to suffer if hit in the face with a ball when playing sport is actually much greater. It protects your teeth from injury during sports and physical activities. They prevent potentially expensive dental work as a result of tooth loss or damage. They are very easy to insert, remove and clean. Plus, the process of having a mouthguard tailor made, just for you, is quick, easy and pain-free. Adults only require a remake every few years, unless the mouthguard becomes overly warn or damaged. To learn more about mouthguard costs click here.